SKF TMMS Series - Tri-section pulling plate Reliability Direct, Inc. Your Direct Source for Reliability, Maintenance, Test & Measurement! 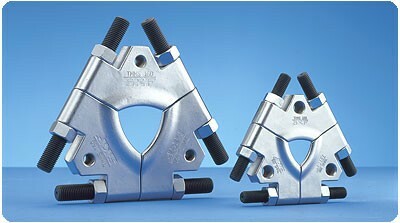 The tri-section pulling plates, TMMS series, are especially designed for use in combination with three-armed pullers. The plates grip behind the inner ring of the bearing housing. This prevents the pulling forces from being transmitted through the outer ring and the rolling elements, minimising the risk of bearing damage. The TMMS series consists of 5 different sizes of tri-section pulling plates suitable for shafts with maximum diameter ranging from 50 to 380 mm (2 to 15 in). Maximum withdrawal force(F max): 80 kN/ 8 ton imp. Maximum withdrawal force(F max): 200 kN/ 20 ton imp. Maximum withdrawal force(F max): 300 kN/ 30 ton imp. Maximum withdrawal force(F max): 450 kN/ 45 ton imp. Maximum withdrawal force(F max): 600 kN/ 60 ton imp.